The use of plastic PVC pipeline is booming in the US and rapidly replacing ductile iron. While there are advantages there are also disadvantages. Unlike cooper or iron pipes that can be found by traditional locators and metal detectors, plastic pipes can be difficult to find. Mainly because of the material that is used especially if a tracer wire or detectable tape was not installed with the pipe. Detecting it can be complicated once buried underground. However, ACS Underground Solutions can locate your plastic lines using our experienced underground utility locating team of technicians. In brief, here are three possible ways that we can locate and mark out your plastic pipes in Connecticut. Tracer wire, which is also called locating wire or locator wire is used to assist in locating pipes and other lines after they’ve been buried underground. Once a pipe is installed a tracer wire is attached to the pipe at the top or center line. This wire is what’s actually searched for if the pipe itself needs to be located. The pipe depth can be determined as well. Another way of marking the location of plastic pipe is with metal detectable tape. 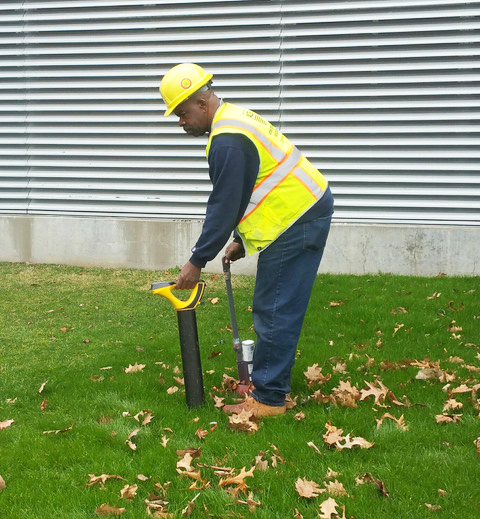 Detectable marking tape is used for detecting, locating, identifying, and protecting buried utility lines for gas, water, sewer, telecommunication, and electrical markets. The width of tape used, is determined by the size of, and depth at which the underground utility line is buried. The depth at which detectable tape is buried, is determined by the width of the tape used. Aluminum core is detected through means of inductive locating. Line is located and marked after inductive locating is performed. Utility type is identified by both the APWA color-code and utility legend printed on the marking tape. Detectable tape works 24 hours a day and year round, even if tape is not inductively located during excavation, the tape provides a “stop-sign” effect that is highly visible. A locator signal can be sent through and end of the tape or by induction using a transmitter on the ground above the tape using a standard pipe locator. Detectable tape is generally buried above the pipe as a dig warning before hitting the pipe an early warning to diggers. It can also be buried shallow as an easier retrofit than tracer wire attached to the pipe itself. An additional method of locating non-metallic pipe is to push a fiberglass probe down the pipe. Fiberglass probe rods are ideal for locating underground utilities such as irrigation lines, water pipes and conduits. The probe has a copper wire core that can send a signal from a standard pipe locator transmitter similar to a tracer wire. Why Hire ACS Underground Solutions Mark Out And Locate Your Plastic Pipe In Connecticut? At ACS Underground Solutions we use advance state-of-the-art utility locating equipment including Ground Penetrating Radar (GPR) to precisely locate every possible underground pipe, cable or structure. Our vast knowledge of all utilities and many years of experience will enable you to safely avoid any potential hazards or costly damages allowing your construction project to be safe and profitable. LEARN MORE ABOUT ACS UNDERGROUND SOLUTIONS IN CT .